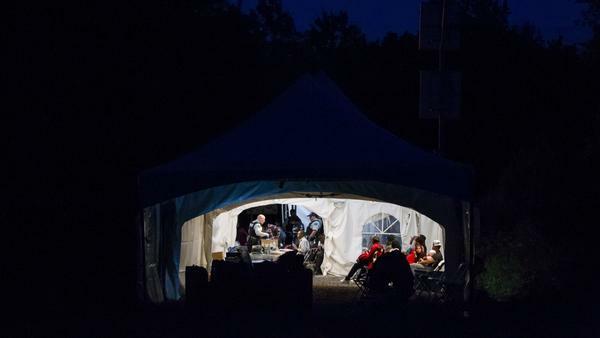 People who illegally crossed the Canada-U.S. border near Hemmingford, Quebec, are processed in a tent after being arrested by the Royal Canadian Mounted Police on Saturday. The flow of asylum-seekers has increased dramatically in recent weeks, and the wait to be processed can be several days, the CBC reports. The Canadian military is setting up a tent camp for new arrivals. A long line of asylum-seekers waits to cross the Canada-U.S. border near Champlain, N.Y., on Sunday. 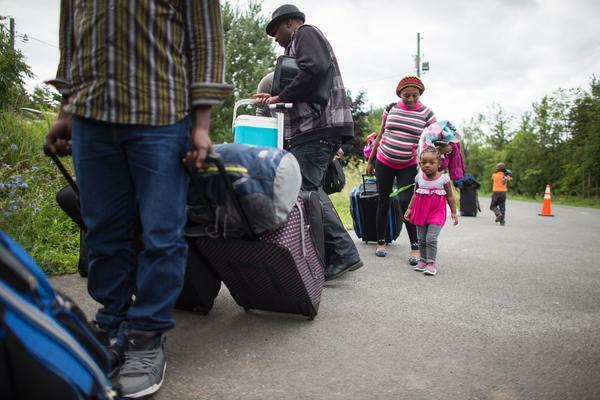 The spike in new arrivals has overwhelmed existing Canadian facilities, and temporary housing is being arranged or assembled in Montreal and along the border. The Canadian military is building a temporary shelter near the border with the United States, to accommodate hundreds of asylum-seekers crossing illegally from the U.S. into Quebec. Most of those arrivals are Haitians who were admitted to the U.S. after the earthquake in 2010, and whose future legal status in America is unclear. Dan Karpenchuk, reporting for NPR, says the Canadian service members are only building the camp, not remaining afterward to staff it. "The camp will hold as many as 500 seekers, about the number of asylum-seekers waiting to be processed," Karpenchuk reports. "The soldiers will also set up lighting [and] heating, and install flooring. They will not have security roles." The CBC reports that currently, the Royal Canadian Mounted Police have a tent set up at the border to handle processing — but there are no beds. People spend two to three days waiting on benches and chairs. The soldiers, at the request of Public Safety Canada, are assembling a camp at a nearby "converted private campsite," the CBC reports. "Setting up tents, this is something obviously we're quite familiar with, we're pretty good at doing this," Maj. Yves Desbiens, the spokesperson on the ground for the Canadian Armed Forces, told the Canadian broadcaster. "But in terms of these capacities, this is not something we do often." The tent camp on the border is just the first stop for asylum-seekers. "After they're processed, the asylum-seekers will be bused to Montreal, where they will be put up in other temporary accommodation, including the Olympic Stadium, a former convent and now a facility at one of the city's hospitals," Karpenchuk says. 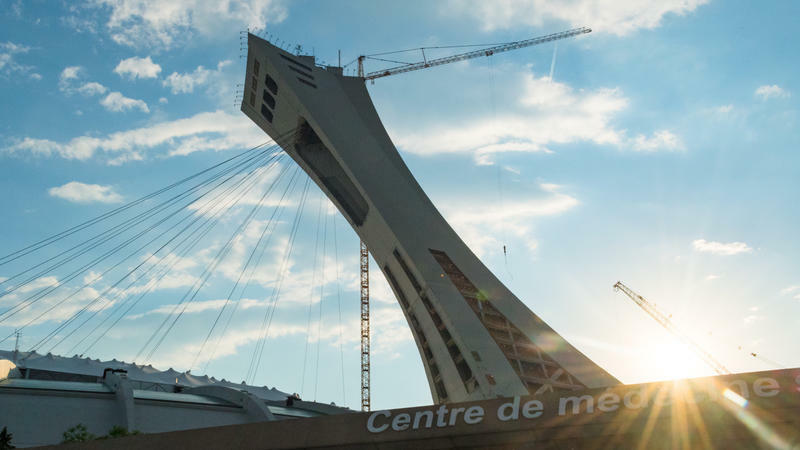 As we reported last week, Montreal's Olympic Stadium has just recently been pressed into service to house asylum-seekers, after normal facilities were overwhelmed. But it's only a temporary option, since the stadium won't be available during upcoming events. The surge has, by all accounts, been dramatic. Last week, a spokesperson for the provincial government organization that helps asylum-seekers told the CBC that the group helped about 180 people last July — and that more than 1,000 people crossed the border this July. Immigration Canada told the CBC on Wednesday that crossings at one point along the border have quadrupled in just the past two weeks. And the BBC reports that there were 3,300 crossings into Quebec in the first six months of the year — then an additional 1,200 just in July. "Tens of thousands of people fleeing the disastrous earthquake were given temporary protected status in the U.S. under the Obama administration; that's not the same as asylum or refugee status, but it acknowledges a person can't return to their home country safely. "The Trump administration extended that status for just six months — and urged Haitian refugees to 'prepare for and arrange their departure from the United States.' The administration cited 'Haiti's success in recovering from the earthquake,' although Haiti continues to struggle with a number of crises, including an ongoing cholera epidemic, a nightmarish sewage problem and a catastrophic hurricane." 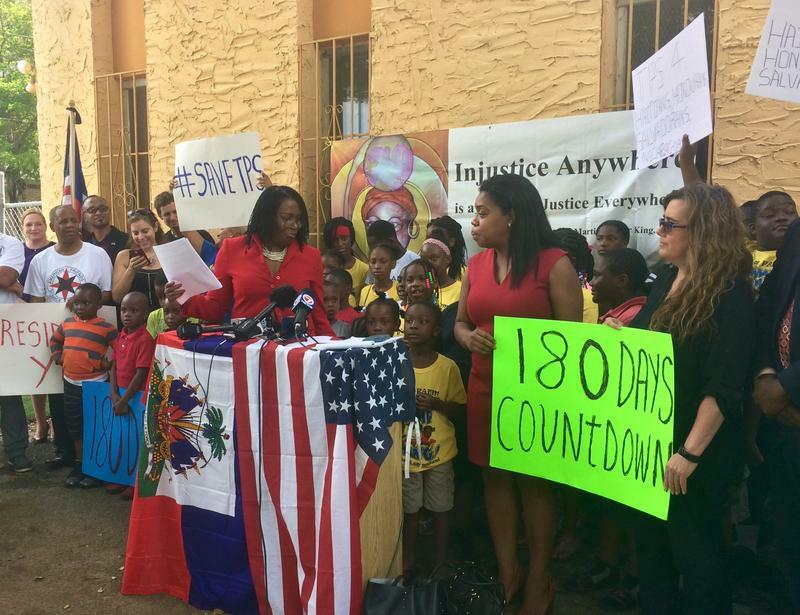 Some 50,000 Haitians are affected by the Trump administration's dictum. Meanwhile, there's a large Haitian community in Quebec, Canada's French-speaking province, which is drawing many of the asylum-seekers in that direction. There's no guarantee that the asylum-seekers will be permitted to stay in Canada. Assessment of refugee status "is done case-by-case," the BBC notes.